When I first visited the Treasure Valley back in 2003 it was pretty much love a love at first site thing. My story starts out like tens of thousands of other people who have made Idaho their home over the last two decades. My wife and I drove up from Denver to visit some friends who had lived by us in Colorado and had moved to Boise in 2001. They raved about how much they loved living in the area - the seasons, the nice people, the family-friendly values, the way it felt like being in a “Denver time machine” (going back 25 years in the past). I remember driving north on I-84 for the first time and passing through Twin Falls and Mountain Home, neither of which struck me as someplace that felt much like what I experienced back in Colorado. However, when we were 5 miles out from Boise city limits our car passed a rest area and then descended through some hills until we turned and corner and dropped right into the “City of Trees” (aptly named). Our eyes caught the foothills and the silhouette of the State Capital and the downtown hi-rise buildings. Sure enough with the tall building, state capitol dome and the foothills it did seem a lot like Denver. I remember seeing the Micron facilities, the half-empty Factory Stores (even back then), and the industrial yards of Southeast Boise. The view from the interstate was not too attractive in that day and I remember secretly hoping that the scenery would improve in that I wouldn’t be disappointed in Boise. (Which it did by the way). The friends we were coming to visit lived in a new neighborhood called “The Legends” at the intersection of Ustick and Eagle Road. Their home was only a couple of years old and new construction homes were being built around them and across the street in the subdivision. One thing about Boise I was impressed with was how much home you could get for the money was something I was initially impressed with being in Boise. When the friends told me how much the new homes were priced for on their cul-de-sac it was hard to believe. Trading dollar for dollar from Denver to Boise at that time for me was almost double the square footage for the same mortgage payment. Today, the Boise area is still less expensive than most other metro areas in the U.S. and new construction and resale homes are plentiful. 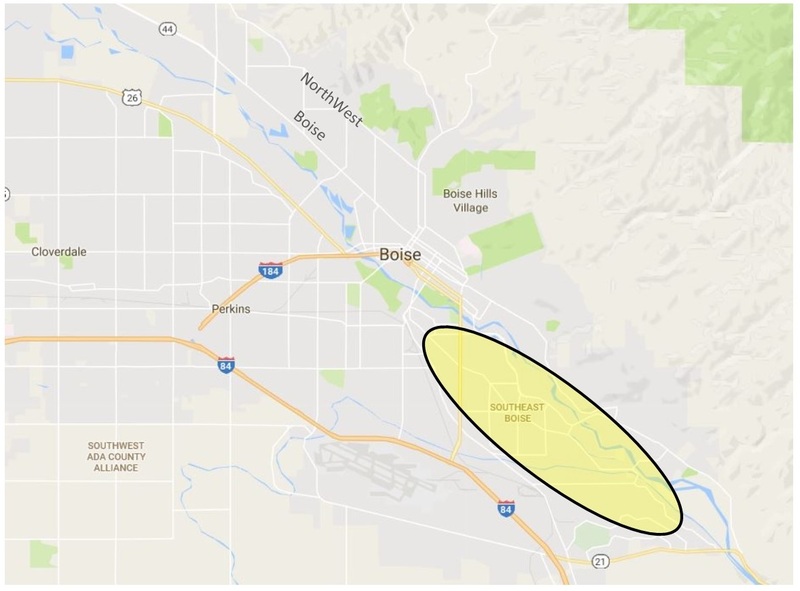 “Southeast Boise" is one of the most desired areas in the city due to its proximity to the Boise River, the foothills, and Lucky Peak Reservoir. It is located with easy access to Interstate 84, Idaho 21, and Federal Way (former U.S. Highway), which are all major arteries to get anywhere in Boise. One of the area’s largest employers, Micron Technology is in southeast Boise and was responsible for much of the area’s growth. Harris Ranch is located in Southeast Boise. Every year Boise ranks on a number of "top 10 lists" or "best" lists. The Treasure Valley has been ranked among the best U.S. downtowns, the best city to raise a family, the best place to do business, the healthiest place to live, best place to retire, best place to be a doctor and go to a great hospital, best place to live for low utility costs, a good spot for asthmatics, the cleanest air, and yes we will go there....Boise was even ranked among the best "top sexually active" cities. With all of these superlatives and other accolades we wanted to know what is really driving people to migrate to Boise and the surrounding cities. A number of answers exist - many people talk about the distinct four seasons and the climate, winters are pretty mild, spring and fall exist, and summers aren't too hot (as long as triple digits don't bother you). The area is relatively affordable. There is plenty to see and do in and near Boise - Camels Back, Hyde Park, Basque Block, Ballet Idaho, Morrison Center, the symphony, the opera, museums, and the Boise River. Recreation is plentiful. Boise is only minutes away from hiking and biking trails, rivers, streams, and mountains with all their endless possibilities. Overall, Idaho is one of the safest places to live in the US. (Idaho has one of the lowest crime rates in the country.) The city is also blessed with a 25 mile long greenbelt. 9. Use your imagination. Psychology Today recommends using yourimagination to help declutter objects that may seem difficult to remove. Try asking yourself unique questions like, “If I was just buying this now, how much would I pay?” These creative techniques may prove to be very helpful for some with difficulties removing unneeded clutter. Our listing has been chosen to be featured on the one-hour daily talk show "The View" produced by ABC. Moderators Whoopi Goldberg, Rosie O'Donnell, Rosie Perez and Nicolle Wallace will welcome Mansions & Millionaires and Extra correspondent Michael Corbett as he showcases the features of the Boise-area luxury home. After seeing the marketing in Global Leverage Partners, the show's producer contacted Listing Agent, Alei Merrill Gothberg, of Amherst Madison Partners to learn more about the 6222-square foot home on acreage with a pool, weight room, and 20-foot waterfall overlooking the Treasure Valley. The home is on the market for $750,000 and can be seen in a "3-D Walkthrough Tour" at EagleSignatureHome.com. Alei Merrill Gothberg and Accel Realty Partners are the exclusive representatives for Leverage Global Partners in all of Canyon & Ada Counties, including Boise, Meridian, Eagle, Middleton, and Star, Idaho. Her personalized service, social network, in-house media department, and intimate knowledge of the Eagle Idaho real estate market make her an ideal resource for anyone considering a move to the area. Visit AleiMerrill.com for more information. 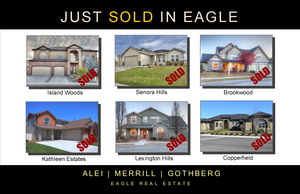 Hi there, just wanted to update you on the Homes for Sale in Legacy Community Subdivision in Eagle Idaho, May 2014. 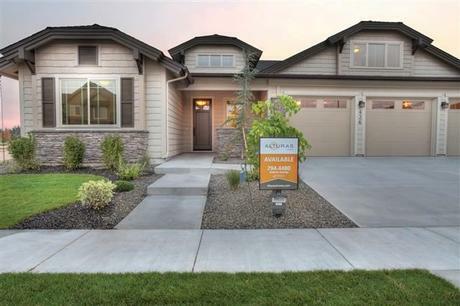 Legacy Community Subdivision is one of the most sought after areas in Eagle Idaho. Located close to downtown Eagle, fun is always a short distance away. Give me a call 208.573.1619 if you have any questions on the Homes for Sale Legacy Community Subdivision in Eagle Idaho or Eagle Real Estate. Below we explain why we are successful at listing your home and how we use cutting edge advanced technology for marketing. Let's be candid, the old methods Do Not work like they use to. The MLS, a sign in the yard, and some full-color brochures are simply not enough in today's marketplace. You need a company with true added value....and a track record of success. A group that makes your house look as good as possible with massive exposure and marketing on literally thousands of online sites to be sure potential buyers are being reached. We Specialize in Advanced Internet Marketing that only 3% of Agents can afford and only the top real estate companies are using. Consider that around 95% of Real Estate Buyers are starting their search online or a mobile device, and the average American spends over two hours a day on the Internet and using other social media. We embrace these dynamics and direct our marketing where Buyers for your home are most likely to be. We do not merely “list” your property and go into a "wait-and-see" mode. We create success through home staging, professional photography and unparalleled digital strategies, in addition to consistent follow up! You can keep doing business the old way...and you can keep getting the same results. Or, you can learn more today about our unmatched marketing systems. Ready to Sell Your Idaho home? Are you looking to sell your home in this awesome market? Today's Real Estate Market requires a different approach to real estate. In order to receive top dollar you must work with a proven professional-someone who understands the technologies and effective marketing that attracts buyers. Results speak for themselves. I know where results come from...studying the market, hard work, determination and a passion for Real Estate. You deserve to be successful and work with a proven professional. My 278 point Marketing Plan, Performance Guarantee, and knowledge provide you the results you are hoping for. Call me at 573-1619 or email me at alei@aleimerrill.com so we can talk about how I can market your existing home or help you buy your dream home! If you are in the market for a new home or just a fun afternoon, dont miss the Fall Parade of Homes. Our team will be hosting the classy Saphire built by Alturas Homes at 436 W. Dreyfuss in Paramount. This is a great floor plan with very functional space in the first level and a Bonus room with bath and bedroom upstairs. 3 bedrooms with an office/flex room all on the main level . The center of the home has a Great Room that lends an open feeling. Granite counters and Kitchenaid appliances are great additions to the giant breakfast bar /island with cupboards on both sides. A beautiful master bath and awesome covered east facing patio. Energy Star Certified to help maintain your comfort and operating efficiency. Stop by this weekend or next from 12-5. Farm Man Challenge - One month Countdown! If you're looking for an "out of the ordinary" race experience, dont miss the 3rd Annual Farm Man Challenge October 27! This is an unusual obstacle run, with a "HELLISH" 6.66 miler, a running with the ZOMBIEs 5k, & a children's pumpkin head dash. All include lots of twist and turns through a corn maze and two or a dozen obstacles. Just Imagine running full speed through 8 foot corn stalks managing yourself through a corn maze, making sudden turns, encountering "entertaining" personalities and passing your friends and other runners right before you tackle an obstacle. If you think its over, you have only just begun having to press on to hurdle, crouch, and maybe even toss under the next series of obstacles. A portion of othe proceeds will be donated back to your local high schools. This is a great fundraising activity for high school athletic departments looking to supplement their programs. Put together a team, make some money, have some fun! Be sure to designate your High School on your registration. Learn more at my blog.